Although this review originally appears in Critics At Large, I include it on this website because the subject is the nourishing value of art, especially literature, poetry and music when living in a repressive state. In 2009, the Russian historian Vladislav Zubok (whom some may recall was the perceptive Soviet commentator in the original 1998 CNN landmark series, The Cold War) published Zhivago’s Children: The Last Russian Intelligentsia. The monograph is an exploration of a generation of artists, scientists and thinkers who adopted the pre-revolutionary values “to regain autonomy from an autocratic regime.” Born in the 1940s, they were too young to remember war and Stalinist repression. Coming of age in the heady days of the Khrushchev Thaw, they welcomed his de-Stalinization initiatives, were sobered by the “soft” repression of the Brezhnev stagnation but still believed that the 1968 Prague Spring with its promise of “socialism with a human face” could turn into a Moscow Spring. The Soviet invasion of Czechoslovakia dashed their hopes. After carefully charting and documenting that painful trajectory from Boris Pasternak’s death to the presidency of Mikhail Gorbachev, and examining the differences and tensions between the liberal Westernized dissidents and the nationalist, often anti-Semitic Slavophiles, Zubok concludes that “their behaviour, with few exceptions among the principled dissidents, was checkered by conformism, cowardice, mutual denunciations, cynicism and hypocrisy. Quite a few of them were unable to resist pressures from the secret police, let alone the temptations of self-aggrandizement, vanity and profiteering.” Zubok tempers that harsh assessment by indicating that the dissident movement “deserve(s) empathy not condemnation” and did contribute to the glasnost policies of openness initiated by Gorbachev. Zudok’s conclusion encapsulates the sentiments expressed throughout Ludmila Ulitskaya’s novel, The Big Green Tent (Farrar, Straus and Giroux, 2015, translated by Polly Gannon). His study is therefore an excellent companion piece to her novel. I had hoped that Zubok might have documented more fully his allegation that many of the dissidents were co-opted by the KGB, a phenomenon that Ulitskaya fully explores in Green Tent. Ulitskaya, born in 1943, could have been a member of the cohort described by Zubok. In her illuminating profile of Ulitskaya in The New Yorker one year prior to the American publication, Masha Gessen reveals that Ulitskaya’s early career as a geneticist and biochemist, was aborted when she was caught and informed upon by a co-worker for retyping samizdat – the practice of transcribing and disseminating banned often foreign literature – and that she later cooperated with the KGB. She turned to the Yiddish theatre, writing plays and then stories during the Gorbachev era. 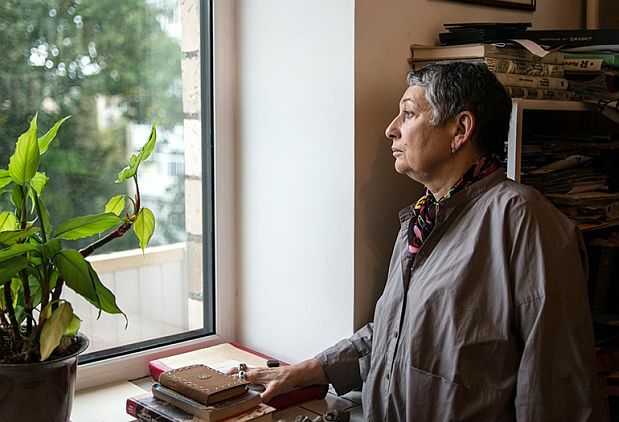 Despite her popularity with the Russian reading public and winning a number of coveted European literary prizes, she has been a vigorous critic of the Putin regime. She helped to coordinate the 2011 and 2012 demonstrations against his re-run for the Presidency, and most recently she has been denounced as a traitor for condemning the war in the Ukraine. This is vital background since she infuses her life experiences into Green Tent, a novel that spans from the time just before the death of Stalin in 1953 to the 1996 death of the poet Joseph Brodsky, fitting bookends since its central theme is the collusion between the repressive state and the vibrant intellectually alive human being. I would suggest that Zubok has written an elegant, lucid monograph. No one would bestow the same adjectives on Ulitskaya’s Green Tent; indeed, it is a structural, chaotic mess. I do not mean that in an entirely ungenerous way because, as will become clear, she has her reasons for her often unwieldy structure. Even though the novel is in some ways a moving homage to Soviet and earlier Russian writers – Tolstoy, Pasternak, Dostoevsky, Nabokov and especially the poets, Pushkin and Brodsky, are frequently referenced – Ulitskaya briefly describes her characters rather than inhabits them, and her style has little of the literary sparkle or the psychological acumen of these writers. She also has an annoying tendency to end a description of a character with a revelation about his or her fate, and we must wait for over a hundred pages for her to narrate in depth how this fate came about. But it should be noted that the sprawling novel of six-hundred pages with its scores of minor characters and mostly non-linear narrative has abundant strengths – a compelling plot written in a conversational style that makes for addictive reading, some interesting characters and a textured, detailed understanding of the dissident milieu during the Khrushchev and Brezhnev eras. Perhaps the most important chapter for understanding The Big Green Tent that appears relatively early on is entitled “The Big Green Tent,” which profiles the relationship between two of the central characters, Ilya and his wife Olga, from its beginning to the death of both of them. Before her death, she dreams of a field with an enormous green tent at its center. Waiting peacefully in line to enter the tent are figures from Olga’s life. “[T]he dead and living were there together”: long departed grandparents, childhood friends, allies from the underground literary scene, the KGB agents who hunted these same allies down. This dream mirrors the structure of the novel in which no distinction exists between life and death, the past and the present; chronology, except in the opening chapters, is of secondary importance. Following this chapter, Ulitskaya pirouettes to an earlier episode in the life of Olga’s father when she was a child– his relationship with his mistress – which offers us a much more human glimpse into him than the distant retired general we have encountered before. This chapter is a reminder that we had better pay close attention because a minor character in one chapter may become in a later chapter the major protagonist. A couple of chapters later, we are with Ilya and Olga who are guests at a raucous wedding. It turns out that this episode, ostensibly inconsequential, is a cover for one of the members of the wedding party, apparently drunk, to slip out and board a train to Finland with a tube of hidden microfiches containing a whole book of contraband material written, smuggled out from one of the camps, and then photographed. So the dissident culture is what this book is all about and we have reached page 200. Well not entirely, as the early chapters make abundantly clear. In the relatively straightforward opening six chapters, we are introduced to three young grade-school boys – Ilya, Sanya and Mikha, the Jewish orphan – who then disappear for chapters, only to reappear individually and later collectively. They come under the influence of a gifted literature teacher Victor Yulievich, a one-armed war veteran who recites poetry at the beginning of each class and inspires students to become the LORLs – Lovers of Russian Literature. He supplements his classes with weekly strolls throughout Moscow regaling them with stories of writers who lived and walked these streets. He inculcates into his charges his belief that the Russian classics can provide them with a philosophical worldview that “literature is the only thing that allows us to survive, the only thing that helps us to reconcile ourselves to the time we live in” and can be a moral compass for “simple things – honor, fairness and justice, contempt for baseness and greed.” In a state that requires its citizens to align themselves with their policies or be crushed, to live according to these values carries a steep risk. Victor himself is fired the year the boys graduate and he makes only three brief appearances in the rest of the novel as a prematurely aged and broken man, regretful and guilt ridden for what happens to them as they mature. Ilya, the realist, has turned an early talent for photography and personal networking into a dangerous career of chronic dissidence; he makes money reselling books in the underground economy but is apprehended and forced to work for the KGB. Sanya escapes from the sordid world around him, including intimacy, by becoming a highbrow music theorist. Yet the authorities regard his isolation to be as an anti-Soviet act. Mikha, the most sympathetic of the three and most influenced by Victor Yulievich, is the idealist both politically and personally. He yearns for a socialist state with a human face but feels deeply disillusioned after the Soviet invasion of Czechoslovakia. His capacity for empathy renders him an excellent teacher for deaf and mute children, but he sabotages his career by naively lending a banned book to a colleague who informs upon him, thereby setting in motion a downward spiral of his life. Yet he can’t help jeopardizing his freedom by championing the cause of exiled Crimean Tatars to regain their homeland. Ulitskaya is clearly suggesting that anyone with a degree of sensitivity risked loss of employment, being co-opted, or dispatched to the camps or psychiatric facilities where repressive therapy was administered for non-conformity. Rather than idealizing her characters, she reveals them as flawed human beings. But like Zubok, she portrays them with compassion. They are loyal; Sanya is exceedingly supportive of Mikha and his wife during their difficult times. Ilya likewise uses his connections to help Mikha get a job. As I indicated earlier, Zubok’s study and Ulitskaya’s novel complement each other. Take, for example, theemigration that occurred on a large scale during the 1970s. The Brezhnev leadership wanted détente with America and could not afford to allow a marginalized but thorny dissident movement to undermine a mutually beneficial nuclear policy. To defuse a potentially explosive issue, those who wanted to emigrate were allowed and dissidents were either summarily evicted or strongly encouraged to leave the country. Over 200,000 Jews alone emigrated during the 1970s. Two of the major characters in the novel pursue that course of action with not entirely satisfying results. They may have hated Communism but a patriotic love of their homeland trumps living in exile, especially in America where despite the superiority of health care, they regard the culture as shallow and unsophisticated. The third, Mikha, is pressured but refuses and pays a high price. Although the bulk of both books focus on the repressive Brezhnev era, it is not hard to read in the subtext, especially in The Big Green Tent, how life is not all that different under Putin.